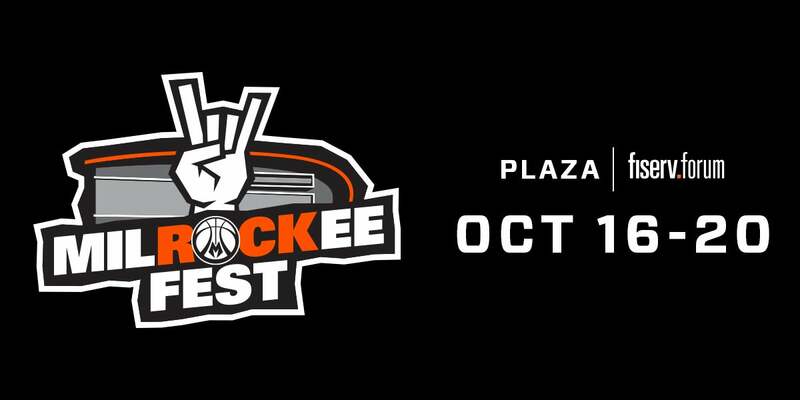 The public is invited to attend MilROCKee Fest, a free festival on the plaza outside Fiserv Forum, which will be held from Tuesday, Oct. 16 - Saturday, Oct. 20. MilROCKee Fest is a celebration of Fiserv Forum’s biggest week yet, which starts with Metallica on Tuesday, Oct. 16, and follows with Foo Fighters on Wednesday, Oct. 17, the Eagles on Thursday, Oct. 18, the Bucks home opener on Friday, Oct. 19, and Twenty One Pilots on Saturday, Oct. 20. MilROCKee Fest will offer music from nationally-renowned artists and entertainment from the Bucks Entertainment Network. Those in attendance can purchase merchandise featuring the bands performing in Fiserv Forum during the week, beer from Miller Brewing Company tap trucks and pretzels from Milwaukee Pretzel Company. Fans can also gather to watch sporting events on a 28-foot-diagonal screen in the plaza’s beer garden. The beer garden opens at 4 p.m. on Tuesday, Thursday, Friday and Saturday and at 3 p.m. on Wednesday. 102.9 The Hog will broadcast live from 3-6 p.m.
National hard rock act Vyces from 5:15-6:15 p.m.
DJ Shawna from 3:30-4:30 p.m.
National rock act Local H from 5-6 p.m.
DJ Whyte Nite from 3:30-5:30 p.m.
Cover band Block Party from 5:45-6:45 p.m.
DJ Quadi starting at 4:30 p.m. The Bucks Entertainment Network, interactive games, trivia and more starting at 5 p.m.
DJ Goose from 11:30 a.m.-2:30 p.m.
Cover band 28 Days from 3-4 p.m. and 4:30-5:45 p.m.
MilROCKee Fest will be held rain or shine.